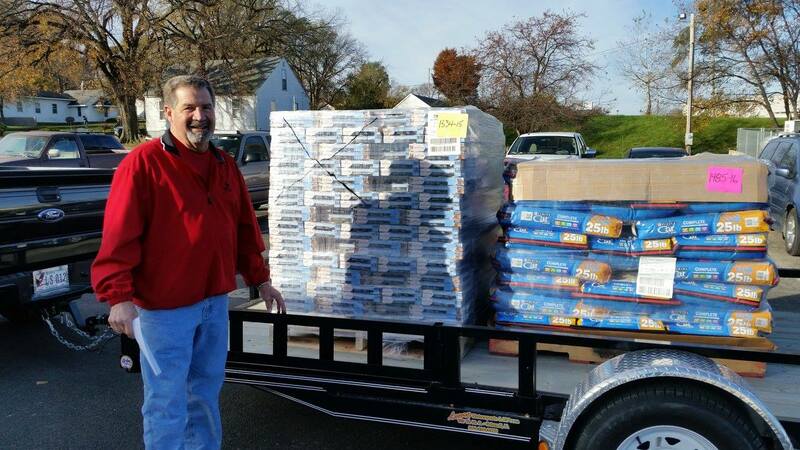 In the summer of 2011, we were contacted by a national organization (Rescue Bank National) asking us to consider partnering with them as the Iowa affiliate for their national pet food donation program. We researched the organization and what would be required of us to participate. The benefits to local rescue groups were so great we decided to give it a try. We’ve been involved with the program for almost two years and even though it is a lot of work, we really enjoy it. It is a great organization and program. Rescue Bank works with pet food manufacturers on a national level and coordinate donations from all over the country. 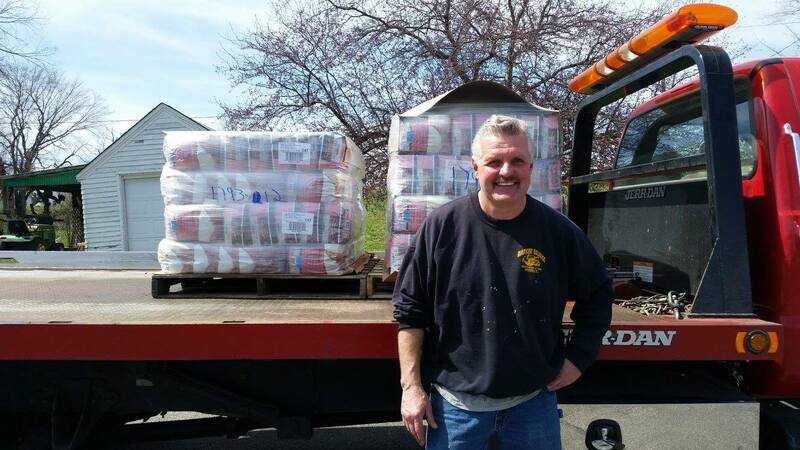 When a pet food company has product they need to move or want to donate, they contact Rescue Bank. Rescue Bank then contacts us asking if we are able to accept a donation. They do this because of the size of the donation and the cost involved. 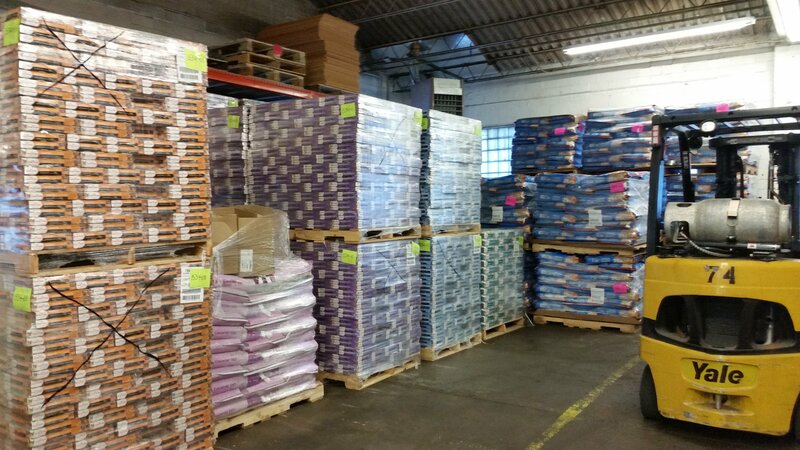 The donations come via tractor-trailer and consist of anywhere from 30,000 – 55,000 lbs of pet food on as many as 50 pallets per shipment. While Rescue Bank subsidizes some of the shipping costs our expenses range from $1,000 – $2,500 per load. 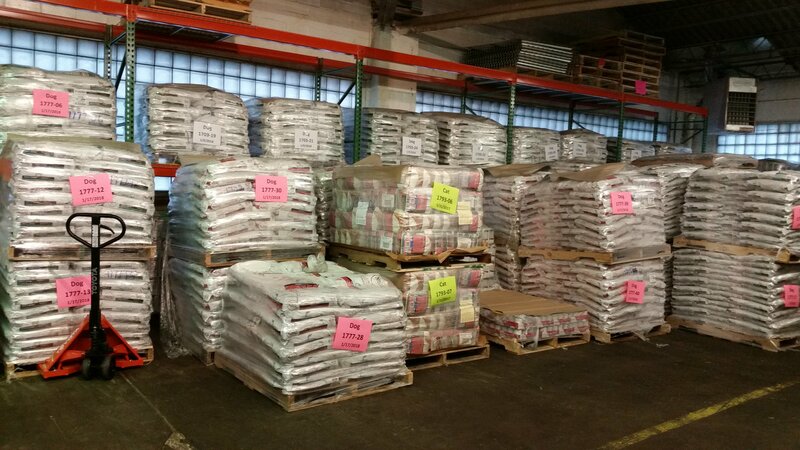 In addition, we need to have warehouse space to house the food and access at the time of delivery to equipment (forklift, skid loader, pallet jack) necessary to unload the food safely and in a timely manner. Once we receive a shipment, we go about the inventory process. After each load we have to provide Rescue Bank with an inventory report listing everything we receive including the lot numbers, best by dates, description, number and size of the items included in the shipment. In addition, we submit monthly reports regarding the distribution of the product. Every bag, box or can of food has to be accounted for according to manufacturer and FDA guidelines. After we complete the initial inventory, we contact our rescue partners asking if they would like to receive any of the product. These groups have already been approved through the application process at the national and local levels. These groups then schedule a time to pick up and load their food to use in their shelter and/or foster homes. Groups pay a minimal handling fee to cover the costs associated with getting the food to our location. This handling fee usually ranges from five to seven cents per pound for the food. The purpose behind the program is to level the playing field and provide easier access to pet food donations to groups that might not otherwise have the opportunity. We work with a lot of smaller and more rural rescues and shelters as they generally don’t have as many resources as larger organizations with more funding options. By offering this program we are allowing the groups to save money on food and freeing funds that can be used for veterinary care. If you are a rescue group or shelter that would like to find out more about our program, please contact us and we can answer any questions you may have. Create a new account and Chewy.com will donate $20 to ARF!